My name is Jenny and I live just outside Stockholm, Sweden, in Håbo-Tibble together with Vintra. And in this writing moment I am planning to take the step toward becoming a breeder. A commitment that I do not take lightly, and it's with great humbleness I look forward to this new role in life as a breeder. Animal has always been a natural part of life. When I grew up, I practically lived in the stable with both school horses and trotting horses at the racetrack. I had my first dog, a Doberman when I was 16 years old and I got my first Ridgeback 2007. My first Ridgeback was Vimla. No dog will ever teach me so much as she did. She accidently broke her leg when she was only 16 weeks old. And our life together took a huge turn. From that day it was rehab several hours a day for several years and then for the rest of her almost 9 year long life. To be able to understand that situation and to be able to give her the best life possible I start to educate myself within fitness and rehabilitation for dogs. 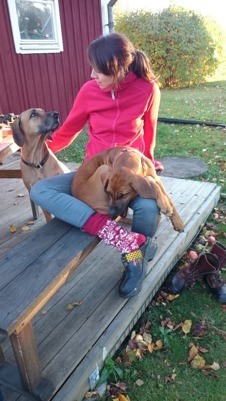 Several courses like: Wellness for dogs, containing physics training, nutrition, anatomy and massage education etc and finally the Physiotherapist education for dogs at Redog in Sweden. Now I own Hundsimmet.se a rehab / workout / fittness center for dogs since 2013. But my main proffesion is Industrial designer and Photographer. I work on freelance basis as self-employed and my clients are everything from small companys and breeders to larger clients like The Swedish Kennel Club and BMW Motorrad in Germany. In 2016-2017 I took the Swedish Kennel Clubs breeders education.